What I eat in a day videos and post are probably one of my favourite things to watch/read. They inspire me to make and try new things and can also be very informative. When it comes to what I eat in day posts it’s very common for individuals to assume that someone either over eats, under eats or doesn’t have a clue what they’re doing! However, this just captures what I ate on this particular day and I can assure you I still consume pizza, crisps, chocolate (vegan of course) and sweets (at least 3 times a week…)! I’m including calories as veganism is often stereotyped as being low in calories and a way of losing weight quick. As you’re about to see this isn’t always true as I now consume a much higher calorie dense diet than I did before going vegan! Probably my favourite meal of the day, I find that having a large breakfast wakes me up more and pushes me through to 11 without a second thought about food! My breakfast tends to vary from cereal, toast, bagels and oats. At the moment my favourite breakfast to have is what I call “Pretty Oats”. To make these I simply pour as many oats as I’m feeling into a sauce pan (roughly 150 grams), with 2 table spoons of cinnamon. I’ve seen many different ways of making oats but I usually just mix mine with water as I find this gives them a more of a thicker consistency. When they have reached the desired consistency I mix in some frozen fruit until the oats are covered with berry juice! 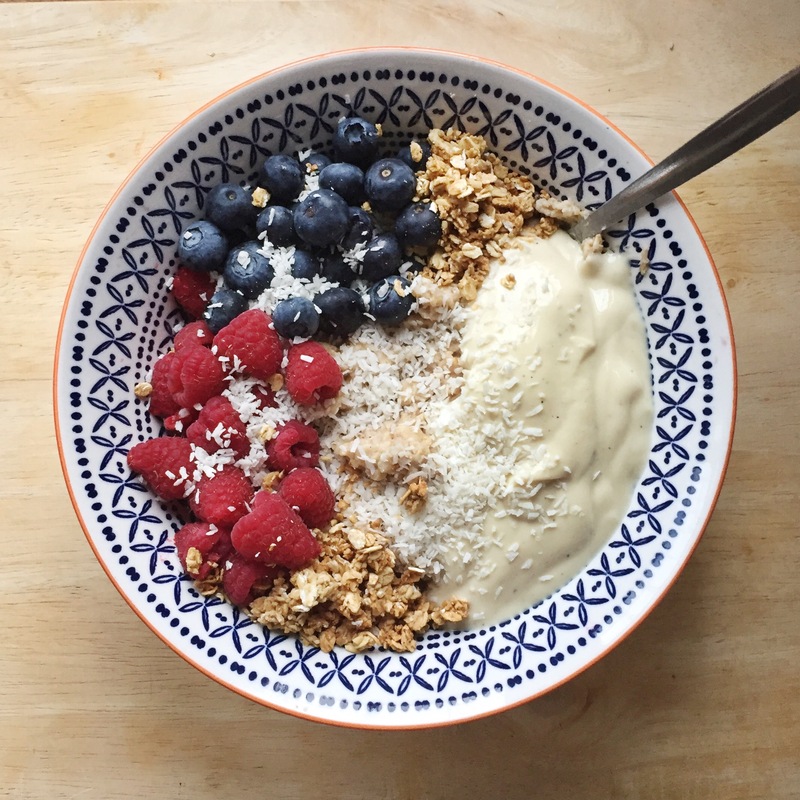 Now to add the toppings, first I grab two handfuls of whatever fruit we have in the house, this day I used blueberries and raspberries, next I add vanilla Alpro yogurt with a handful of granola and a sprinkling of coconut! And that is how you make Pretty Oats! As I work up London I currently have to make a 2 hour travel into work which means I have to get up at a very early time! To save me time in the morning I usually make my breakfast the night before. 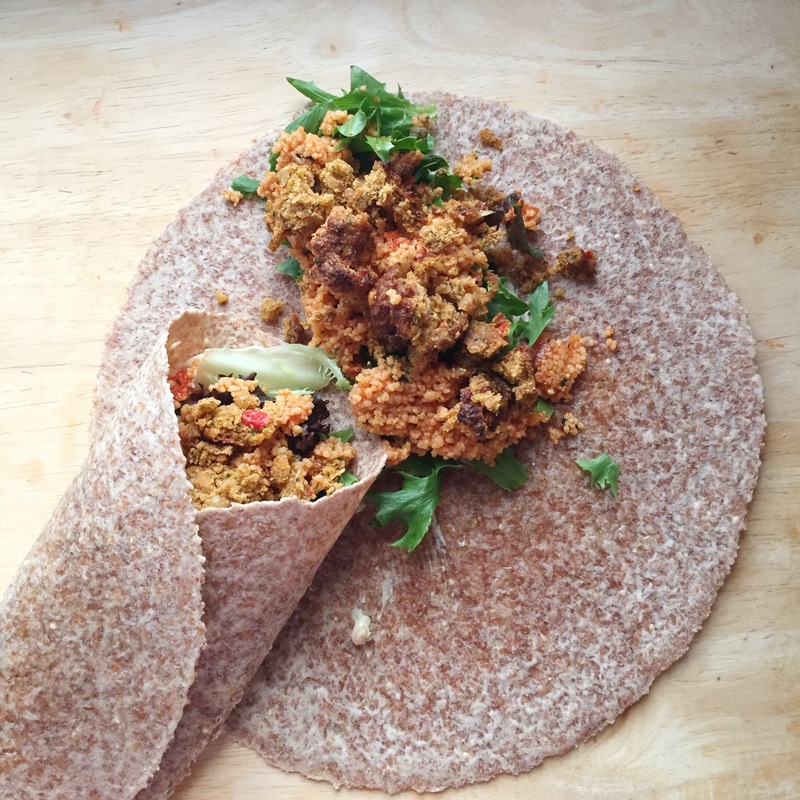 To make these falafel and couscous wraps I start by taking one of the wraps and spreading hummus down the centre (tip- once wrapped place hummus along the fold to keep it stuck together), next I take iceberg lettuce with cucumber, onion and carrot and evenly add this on top of the hummus. Take your choice of falafel and couscous (I personally love the tomato and spinach one from Morrison’s) and spread this over the salad. I personally make two of these as I find one doesn’t fill me up enough! 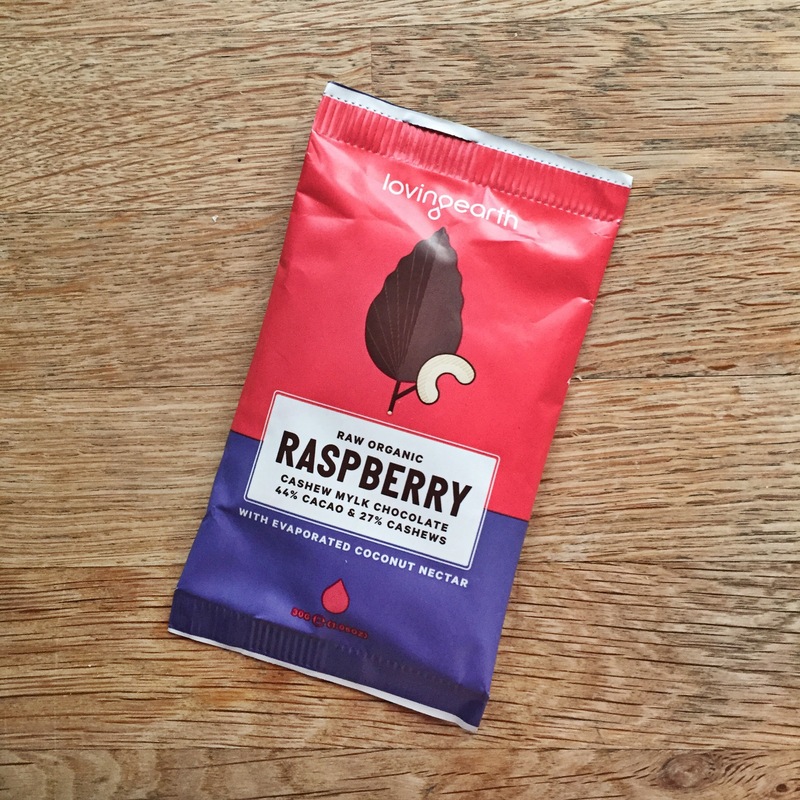 Hope you enjoyed this What I eat in a day blog! Would you like more of these in future or other vegan related topics? Let me know down below! Contact us via social media or email, we always love hearing from you guys! Be sure to follow us on Instagram in order to be in with a chance of winning out 1000 followers give away! I really like these type of posts, they are so inspiring. I would love to see more of these in the future!